Balance sheet refinanced; improved headline earnings per share growth delivered. The South African economy slipped into recession during the second quarter of 2018, shrinking by 0.7% quarter-on-quarter (seasonally adjusted and annualised). South African household consumption expenditure fell in the second quarter of 2018 compared with the first quarter of 2018, in line with the fall in retail trade sales. Households spent less on products such as transport, food, beverages and clothing. Manufacturing was the third industry to record a second consecutive quarter of negative growth. Manufacturing activity fell by 0.3%. As reported by StatsSA. The group's revenue was impacted by the effects of the recent recession in South Africa, pressure on the group's key economies in the Rest of Africa and a strong rand for the greater part of the financial year which adversely impacted the translation of the group's revenue from its dollar based operations. Despite soft consumer demand limiting turnover growth trading profit of R2.0 billion increased by 3% compared to the prior year. SA Metals performed well despite increased competition, UK Plastics successfully implemented its turnaround plan to trade profitably complemented by a strong performance from the Paper business. The timing of cash transferred from Angola to South Africa was optimal as these dollars were converted to rand at a favourable exchange rate. During the year the group made the strategic decision to dispose of Nampak Glass and consequently it has been disclosed as a non-current asset held for sale and a discontinued operation. This transaction is progressing according to plan and is expected to be concluded in the second half of the 2019 financial year. The group continues to address overhead cost and this has led to the Project Rejuvenate being implemented in the South African Plastics business. This programme is in progress and will result in a re-engineered business with a decision taken to sell the Megapak crates and drums business with these assets and liabilities being disclosed as assets and liabilities held for sale at the year-end. This is a focus area for the group and will continue to receive the required attention. The financial year was concluded with the successful negotiation and implementation of a four and five-year committed revolving credit and term facility which substantially strengthened the group's financial position and addressed the group's maturing debt profile. The securing of the R12.5 billion financing package has positioned the group well for the next five years and placed the group in a strong position to consider growth opportunities. Strong focus was placed on working capital management during the year, the effects of which are reflected in the 30% reduction in the net interest cost before taking into account the Angolan tax included in net interest costs. The group's year-end fell on a Sunday which adversely impacted receipts from trade debtors at the year-end. ** Based on trading profit. Considering a difficult year from a revenue perspective, the 3% increase in the group's trading profit to R1 970 million from R1 922 million has been a pleasing outcome assisted by trading margins improving to 11.4% from 11.0%. The metals segment delivered a solid result with a 2% increase in trading profit assisted by forex gains in the Bevcan operations. Angola had a tough year but the group is hopeful that this position will improve as oil prices rise and these economies begin to stabilise. Bevcan South Africa and Bevcan Nigeria delivered improved results. The 22% improvement in the plastics segment's trading profit is largely attributable to the UK business returning to profitability in the year complemented by Megapak Zimbabwe's strong performance. Plastics SA experienced a tough year and continues its plans to restructure with significant portions of the plan already underway. The transactions to sell the Megapak crates and drums business are expected to be completed in the second half of the 2019 financial year. The paper segment delivered a stellar performance with strong performances in the Nigerian Cartons business and the Zambian operation. The corporate segment is largely affected by foreign exchange movements and this year saw an adverse swing of R74 million in forex losses incurred or reduced gains with the majority of these forex movements being unrealised. Excluding these movements, head office savings to the value of R29 million were achieved. These gains were offset by the non-recurring PRMA gain of R28 million delivered in the prior year. Geographically, South Africa contributed 58% (2017: 57%) to revenue and 44% (2017: 44%) to trading profit. The Rest of Africa contributed 34% (2017: 35%) to revenue and 66% (2017: 65%) to trading profit. The UK contributed 8% (2017: 8%) to revenue but made no contribution to trading profit though recovering from a loss of R64 million in the prior year to a trading profit of R5 million in the current year. The average rand/dollar exchange rate for 2018 of R13.1073 was 2% stronger than the comparative rate of R13.3832 adversely impacting the translation of the results from foreign operations on consolidation. The impact of the stronger average rand was R261 million on group revenue for the year. The average rand/sterling exchange rate in 2018 weakened by 4% to R17.6079 compared to R16.9564 in 2017 positively impacting group revenue by R52 million. In US dollar and pound terms we earned less in 2018 than in 2017. Trading profit in the Rest of Africa declined in dollar terms and was negatively impacted by R25 million in 2018. The UK returned to profitability in pound terms and the impact of the exchange rate was therefore minimal. Restructuring and retrenchment costs are largely related to the Plastics business in South Africa, the proposed sale of the Megapak Crates and Drums businesses as well as the closure of the Bevcan Epping site. The plan related to plastics incorporates site closure, consolidation and relocation, head office relocation, existing business optimisation and seeking growth opportunities. Cash transfers amounting to R3.5 billion from Angola, Nigeria and Zimbabwe have been successful during the current financial year with efforts ongoing to ensure cash is successfully transferred from these countries to the group's international treasury and procurement company, Nampak International Limited and South Africa. This is further explained under the detailed section related to cash transfers and hedging. While every attempt is made to keep costs related to this transferring of cash to a minimum this is not always possible and an amount of R73 million was incurred during the current year. In addition, the weakening of the Angolan kwanza from 171.75 to 300.72 to the US dollar has resulted in devaluation of R116 million during the year. The balance of the devaluation relates to the Nigerian entities. With property remediation related to site closure and disposal becoming more prevalent, a decision was taken to reassess the provision related to property closure and disposal costs, with an additional provision of R64 million being raised in the year at a corporate level. Significant actions have been taken to remedy our overhead cost base and to review the group's structure. It is expected that these actions will have a positive impact on the group's performance going forward. * Cash transfer rate is the cash transferred from the country compared to cash on hand at the end of the previous period. ** No suitable economic hedge available. The above rand equivalent of dollar cash balances has increased due to the 4% weakening in the year-end spot rate compared to the prior year. The NIFEX and NAFEX exchange rates converged during the year and were almost on a par at the reporting date. The Central Bank of Nigeria has boosted its dollar reserves with US dollar reserves of US$44 billion up from approximately US$20 billion two years ago. Cash of R1.6 billion transferred from Nigeria exceeded expectation, representing a cash transfer rate of 190% with no material restrictions impacting the operations. Cash on hand at the end of 2018 of R300 million reflects a 64% reduction from the R828 million held at 30 September 2017. Cash generated during the period was, for the most part, also transferred. This is a pleasing outcome given the previous concern related to this territory. No hedging is required due to good in-country liquidity and a stable naira/dollar exchange rate. It should, however, be noted that the exceptional transfers from Nigeria are not expected to be matched going forward as the arrears accumulation of funds has largely been remitted. Flows from Nigeria will now be normal operational flows based on profits generated. The Angolan operation remains highly cash generative. The improvement in the cash transferred during the year to R1.8 billion from R0.8 billion in the prior year reflects the concerted effort that management has placed on this risk area. The increase in the cash transfer rate to 83% from 77% in the comparative period was encouraging with 94% of the remaining in-country cash balances hedged at the year-end. Of the R1.8 billion transferred, R1.0 billion was remitted to the group's Rest of Africa treasury and procurement operation, Nampak International Limited, and R0.8 billion was utilised to fully settle export funding provided by Bevcan SA to Bevcan Angola for ends exported to Angola. 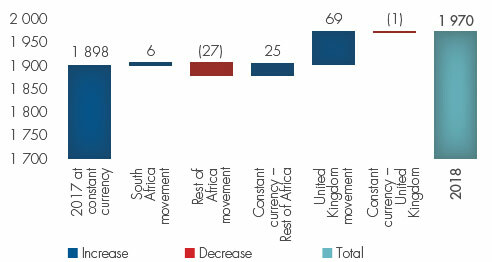 Cash balances increased in rand due to the weaker rand/dollar exchange rate, the highly cash generative nature of the business and the contracted working capital position at year-end that boosted the cash balance. 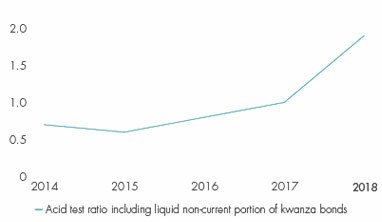 The kwanza continues to devalue, with a 75% devaluation from AOA171.749 in 2017 to AOA300.721 in 2018. The group continues to hedge its foreign exchange exposures in Angola. Our strategy to hedge the cash in Angola through the purchase of US dollar linked kwanza bonds has resulted in the avoidance of R1.6 billion in potential foreign exchange losses. These hedges have proven to be highly effective. Cash continues to build in Zimbabwe given the highly cash generative nature of these operations despite all efforts to transfer cash from this region. There are some potential opportunities for hedging and transferring of cash being explored. 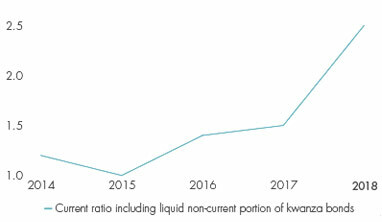 While the success of the past year has been stellar with total cash transfer rates rising from 75% in the prior year to 94% and from R1.7 billion to R3.5 billion in value in the current year it should be noted that risk to liquidity in the relevant markets remains, given local developments such as elections in Nigeria. The situation in each country is being closely monitored and it is possible that the transfers from theses countries in the year ahead may not be repeated. Angolan hedging remains strong with pleasing liquidity during the year. Zimbabwe remains a focus area. Proactive management has resulted in net finance costs of R156 million, before the inclusion of Angolan capital enforcement tax (Imposto sobre a Aplicação de Capitais) being down by 30% and unchanged from the prior year inclusive of this tax. In terms of International Financial Reporting Standards, this tax on gains resulting from Angolan indexed bonds, is disclosed as an interest cost. The effective interest rate for the group for the period was slightly higher at 5.6% in 2018 compared to 5.4% in 2017. In line with the group's strategic intent to increase its long-term funding, a committed revolving long-term credit facility was successfully implemented to address the group's maturing debt profile. 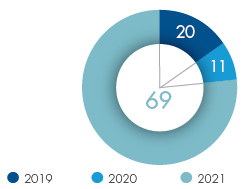 With the implementation of the revolving credit facility the group's effective interest rate is expected to rise to 6.0% with the sound funding structure providing a platform for future growth. This facility was implemented on 28 September 2018 and therefore did not have an impact on the interest cost this year. The reduction in the effective tax rate is primarily due to the non-recurrence of impairments and forex losses that did not provide a tax shield in the prior year. This has been offset by increased deferred tax assets raised and a reduction in government incentives. The normalised effective tax rate before these items of 10.7% is marginally up from the 10.6% in the prior year. 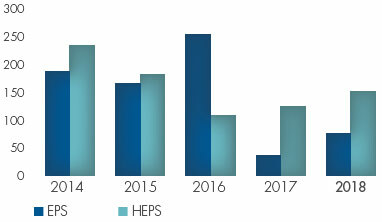 EPS and HEPS have both increased pleasingly over last year with non-recurrence of the once-off items previously experienced. While abnormal foreign exchange losses continued this year in Angola this should now start to normalise. 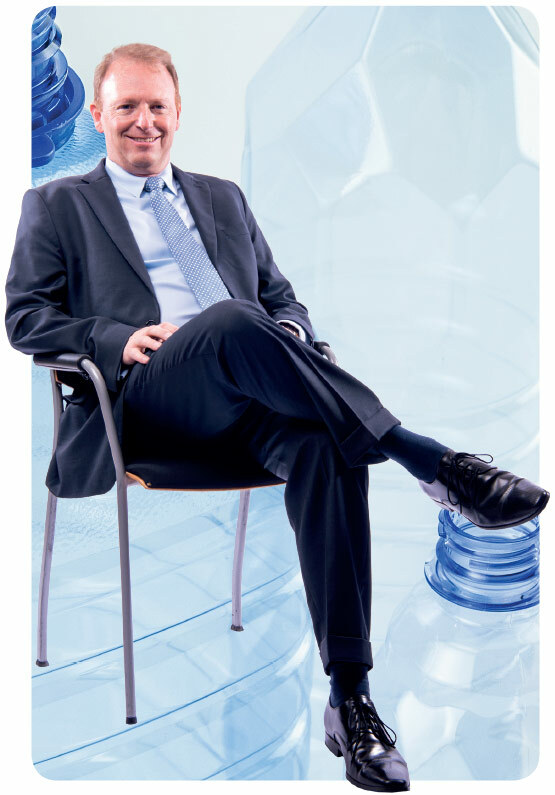 In the current year, a strong performance by Bevcan South Africa was complimented by the plastics business in the UK that returned to profitability creating more stability in the group’s earnings. Through the capital assurance committee, the group continues to allocate capital to capital expenditure prudently without compromising the integrity or productive capacity of the group's property, plant and equipment. Capital projects are evaluated by a multi-skilled capital assurance committee that sets clearly defined hurdle rates of 1.5 times the in-country weighted average cost of capital. Capital expenditure has been well managed reflecting a decrease of 20% from R558 million in 2017 to R445 million in 2018. The aerosol line A1 upgrade in DivFood cost R30 million this year. The cost of site consolidation of Industria and Isando in plastics amounted to R36 million in the current year. The purchase of property in Megapak Zimbabwe for R46 million. 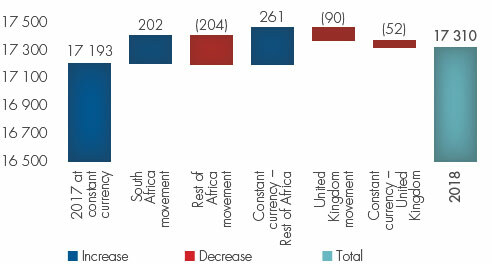 Cash generated from operations before working capital changes decreased by 5% partly due to the 2% on average rand dollar exchange rate impacting foreign operations and tough trading conditions. The decrease of R473 million in cash generated from operations is largely attributable to working capital changes. Inventory levels have been well managed throughout the year with a significant drive from management to reach optimal inventory levels. In 2018, we reduced inventory levels by R106.7 million and utilised this cash to early settle trade payables were possible. Nampak's 30 September 2018 year-end fell on a Sunday, which despite every effort from management to ensure the timeous payment from customers, certain customers' payments only reflected in the bank on 1 October 2018. 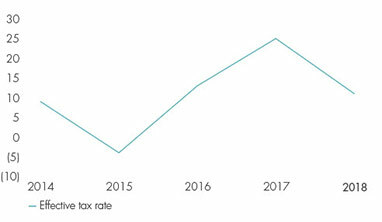 Strong working capital management throughout the year resulted in 30% reduction in the net interest costs excluding the Angolan tax included in net interest cost. The trade receivables outflow is a timing issue and is not representative of normal year-end closing positions. With the improved cash transfers from Angola, management utilised in-country bond balances to obtain foreign currency. The increase in liquid bonds in the current year of R6.9 million compared to R1.3 billion in the prior year is evidence of bonds maturing and sold being utilised to transfer funds. Capital expenditure was well managed with a decrease of R198.9 million in the outflow relating to capital expenditure. No major projects were undertaken during the year. Net cash of R323.8 million before financing activities was generated in the year compared to a utilisation of R1 180.6 million in the prior year. Strong cash generation from operations was complimented by good capital expenditure management and strong cash transfers from Nigeria and Angola, partially offset by an increasing investment in net working capital. The successful negotiation and implementation of a four and five-year committed revolving credit and term facility led to a net increase in non-current borrowings of R1.6 billion. The group achieved a much improved cash position at the year-end compared to the prior year with a significant positive cash balance of R1.8 billion compared to the prior year's overdraft of R169 million. This was largely attributed to increased cash transfers from previously cash restricted areas, reduced net investment in liquid bonds, borrowings raised through the successful implementation of the revolving credit facilities and improved capital expenditure management. Due to the in-country shortage of US dollars, the highly cash generative nature of the Zimbabwean businesses and the weakening of the rand dollar exchange rate, the Zimbabwean cash balance increased from R654 million to R1.2 billion at the year-end. Net cash and cash equivalents have increased by R1 983.5 million compared to a decrease of R1 419.0 million in the prior year. year but ahead of the weighted cost of capital. 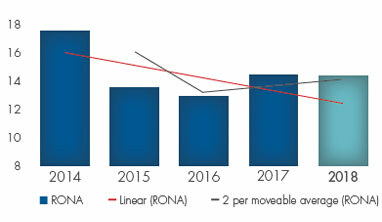 A pleasing downward trend in the net gearing ratio has been achieved through a combination of the sale and leaseback transaction in 2016, prudent management of capital expenditure, a focus on working capital management and the cessation of the dividend for the last three-years. 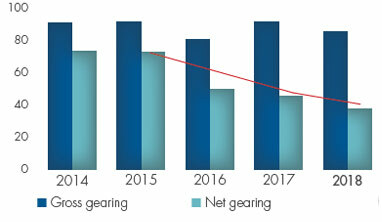 The net gearing ratio of 37% has been reduced from 45% in the prior year. 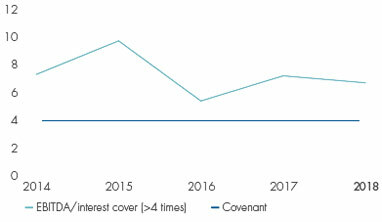 The refinancing of the group's maturing debt profile has significantly improved the funding structure with resultant improvements in the current and acid test ratios. These positions are the strongest that they have been in the last five-years. 2018 has been a successful year in addressing the group's maturing funding structure and in transferring R3.5 billion from Angola, Nigeria and Zimbabwe with 97% of these funds transferred being secured from Angola and Nigeria. Net gearing has reduced to 37% from 45% with short-term liquidity ratios being significantly strengthened through the group's new financing structure. The definition of cash and cash equivalents for covenants purposes for the committed revolving credit and term loan facility has been amended to only include 50% of Angolan cash and cash equivalents and US dollar linked Kwanza bonds plus 45 days net working capital for Angola and in excludes all Zimbabwean cash. 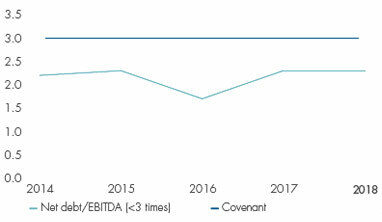 The group remains comfortably within both covenants as set out in the five-year financial review and in the following graphs. These maturing debt profiles were addressed through the successful implementation of the group's committed long-term revolving credit facility and loan facilities. On 25 September 2018, Nampak refinanced and re-organised its funding structure in order to optimise liquidity, flexibility and capacity for growth raising R12.5 billion. It has refinanced its existing, bilateral ZAR and US$ facilities into one common terms agreement catering for multiple currencies and borrowers in order to address a maturing group debt profile. The facilities raised include Facility E the use of which will be restricted solely for settling the US$115 million private placement falling due in May 2020. In addition, the group's funding structure includes US$175 million in private placements with US$115 million maturing in May 2020 and US$60 million maturing in May 2023. There is a significant cost to early-settle these facilities and as such, the US PP note holders will be settled on maturity date of the existing facilities utilising Facility E.
Bevcan Angola is classified as a US dollar functional currency entity as it meets the requirements of IAS 21: The effects of Changes in Foreign Exchange Rates as the currency that mainly influences sales prices for goods sold, the currency that mainly influences labour, material an other costs of providing these goods and the currency in which funds from financing activities are generated is the US dollar. The group does not apply hyper-inflationary accounting to Bevcan Angola as IAS 29 Financial Reporting in Hyper-Inflationary Economies states that this standard shall be applied to the financial statements, including the consolidated financial statements, of any entity whose functional currency is the currency of a hyper-inflationary economy. Accordingly, despite Angola being classified as a hyper-inflationary economy, the group does not apply the standard as the functional currency of Bevcan Angola is the US dollar and not the Angolan Kwanza. Following a careful review of the Glass business, challenges in leveraging economies of skill and scale, and the significant capital requirements, the board decided, on 16 February 2018, to dispose of the glass business in order to free up cash for potential growth, debt reduction and to enhance free cash flow. Accordingly, Glass has been accounted for as a non-current asset held for sale and a discontinued operation. A formal disposal process is progressing and is expected to reach its conclusion in the first half of the 2019 financial year. 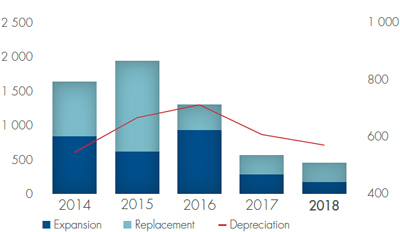 The valuation of the Glass business is highly sensitive to key variables such as the pack to melt ratio, various profitability ratios, growth rates, the extent and timing of capital expenditure and working capital assumptions as well as the discount rate. The business continues to be production constrained as opposed to demand constrained. Accordingly, management is focused on improving internal production efficiencies through improved processes and the securing of further skills to ensure that it can meet growing market demand. After careful consideration and detailed evaluation the board has, based on a value-in-use valuation, decided to impair the Glass asset by R665 million with a further impairment of R12 million relating to certain moulds. The board has decided not to resume dividends to shareholders until the sustainability of the transferring of cash from Angola and Zimbabwe is assured and the disposal of the Glass business is finalised. The Board will evaluate the various options available with a view to enhancing shareholder value. On 1 October 2018 the Zimbabwean Reserve Bank announced the splitting of the Zimbabwean RTGS (real time gross settlement) notes and foreign currency accounts. This has led to consideration of whether the functional currency of the Zimbabwean operations has changed from US dollars to a local Zimbabwe currency. In the event of a change in the functional currency, this may lead to a revaluation of assets and liabilities in Zimbabwe. The group will continue to prudently allocate capital to capital expenditure with a specific focus on growth projects complementing necessary replacement expenditure. In addition leveraging the group's modernised asset base is expected to unlock future value. The further streamlining of the working capital cycles will be a priority complemented by a sharp focus on procurement and supply chain. The refinanced balance sheet places the group in a strong position and provides a platform for future growth. I would like to thank the finance team for their diligence and resourcefulness in what has been a successful year, and the group committees, as well as our providers of capital, for the support during the year. We look forward to meeting the challenges and harnessing the opportunities in the year ahead and delivering value to all our stakeholders.